Please join us there for the latest news on your favoriate chess team. Congratulations to NM Eric Rosen of the Chicago Blaze, who drew wunderkind GM Ray Robson in the first round of the U.S. Junior Closed Championship now taking place in St. Louis, alongside the U.S. Women’s Championship. Take a look at this exciting game, with strong threats on both sides of the board. “In a match-up that featured the greatest rating differential in the tournament, Robson (2613) took on NM Eric Rosen (2209). Rosen did not let the 404-point difference faze him. “Robson said it was a complicated position in the middlegame that led him even deeper into time trouble. “’I was doing fine up until I blundered [37…] Kh7,’ he said. See Bill Brock's commentary as well. The 2010 U.S. Chess League season begins next month, and the Blaze kick off this year's campaign with a match against the Seattle Sluggers, one of the top teams in the league’s Western Division. We finished last season with a draw against that team. The whole schedule appears below. This year the Blaze will play its matches in new digs provided by the North American Chess Association. Stay tuned for details (and the Skokie address). Fans are welcome to attend the games free of charge, so please come and cheer your team. If you can't make it to the site you can tune in to the matches live on the Internet Chess Club (membership required). You can also follow the Blaze on Twitter and Facebook. 98 players forming 23 teams showed up for this year's edition of the US Amateur Team North held at the wonderful Crowne Plaza Hotel in Milwaukee. The spacious and nouveau hotel was an excellent upgrade for the event held by Alex Betaneli and Ashish. The fun filled tournament was TDed by none other than the Blaze's own Manager Glenn "all star" Panner. The strong tournament was won by a team lead by Blaze superstar player IM Angelo Young. His team, "Pinoy Chicago Chess Team," went undefeated for a 4.5/5 score to clinch first. The event featured none other than two GMs (Dmitry Gurevich and Alex Yermolinsky) and a total of 11 masters! Still the biggest news of the event had to be that the tournament would end with 12 masters. The newest IL master was minted in the USAT North, none other than the Blaze's own: Trevor Magness! 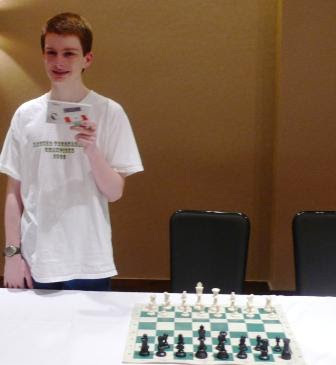 Trevor put up a tremendous 5/5 score on board 1 to score his new 2208 National Master rating! His biggest upset had to be his round 1 victory over seasoned GM Alex Yermolinsky. Here is Trevor's excellent analysis on his game with GM Alex Yermolinsky. Also, Blaze Assistant Manager Daniel Parmet managed to put up a 5/5 score on board 3. Go Blaze! We have much to be thankful for in the Chicago Blaze season recently concluded. Let’s start with the players themselves. These guys deserve a round of applause from all Illinois chess fans, for showing up every week, playing hard, often (usually) against higher-rated opponents, and giving us a team we can root for and be proud of. Congratulations to IM Angelo Young of the Chicago Blaze for being named an all-star in U.S. Chess League's first team. The league has first, second, and third all-star teams, and Angelo is Board 3, behind GMs Hikaru Nakamura and Boris Gulko, on the first team. With NM Eric Rodriguez on board four, that's one heck of a team. This comes as no surprise whatsoever, of course. Angelo was undefeated in six USCL games this year, extending his undefeated streak from the 2008 season. He's never lost a USCL game. It's hard to find anything new to say about Angelo's extraordinary performance that hasn't been said before. He won the league Upset of the Week prize twice (a record), and won a game on Board 1 against a much higher rated player in a match where Angelo was filling in at the last minute for a sick teammate. Amazing. We have been remiss, I must admit, here at the Chicago Blaze blog, at covering the fairly exciting post-season action in the USCL, and as it happens I don't have time to redress that neglect at the moment with a lengthy post (all the usual excuses), but go to the USCL site to see all the playoff games. In due course we'll try to bring Blaze fans up to speed on the thrilling 2009 USCL postseason. This is the blog of the Chicago Blaze chess team, which plays in the United States Chess League. Please come here regularly for news about the Blaze and also visit our main Web site.